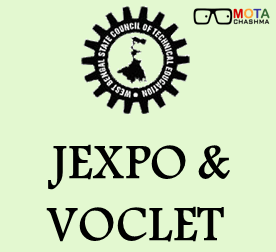 JEXPO 2018 and VOCLET 2018 Special Offline Counselling is scheduled to start from 19 July 2018. Candidates can now click on the link given below to know more about the Counselling. Candidates need to enter their credentials carefully. Candidates who successfully qualify in their JEXPO result will be able to secure their admissions into their desired DIploma courses in Government, Government sponsored and self-financed polytechnics in West Bengal. Candidates are required to take a print out of their JEXPO result 2018 for future references. The entrance exam for the same was held on 20 May 2018. Candidates can get more information related to the result on this page. Latest Update: JEXPO and VOCLET 2018 Special Offline Counselling scheduled to start from 19 July 2018. JEXPO Exam Date - Revised Date! VOCLET Exam Date - Revised Date! The JEXPO and VOCLET eligibility criteria for the year 2018 are given separately. The candidates can find the details on JEXPO and VOCLET age criteria and the academic qualification details. Academic Qualification: The applicant must have passed or appeared in Class 10 with at least 35% marks without an additional subject at the qualifying examination. NOTE: The Mathematics, Science, and English are compulsory subjects for both JEXPO and VOCLET exam. Offline Form: Candidates can buy the application form from all Government, Government Sponsored and Self-Financed Polytechnics affiliated to WBSCT & VE & SD [Erstwhile WBSCTE] in West Bengal and one Centre in Tripura (for JEXPO only). The application process has already started from 29 January and the candidates have to apply for the JEXPO and VOCLET by 5 March 2018. To get the complete step by step guidance to fill the JEXPO and VOCLET application form, the candidates need to follow the link below. The candidates should submit the correctly filled application form to all Polytechnics affiliated to WBSCTE and other centres in West Bengal which would be selected by the Council and one centre in Tripura (JEXPO only). Below is the additional list of Institutes from where the candidates can get the JEXPO 2018 Application Form and VOCLET 2018 application form once it is out. Online Form: Candidate can also fill the form online by visiting the link given below and follow these steps to complete the application process. STEP 1: Fill all the details required in the application form and upload the scanned photo, signature and left-hand thumb impression. STEP 2: After filling all the details, click on submit and take the print out of the filled-in application form. STEP 3: Validate the filled-in application form from any of the Polytechnics affiliated to WBSCT & VE & SD by submitting one copy of the application form and paying the requisite application fee in cash. The official conducting body of JEXPO 2018 and VOCLET 2018, i.e., WBSCTE will announce the result on its official website. The result for the JEXPO and VOCLET is declared on 1 June 2018. After the announcement of the result, the scorecard will also be available to download. Shortlisted candidates will be called for JEXPO 2018 counselling process. The candidates who passed the exam will be further called for the JEXPO 2018 & VOCLET 2018 selection process. The selection of the candidates will be done on the basis of the result of written admission test. JEXPO is conducted in objective mode. Questions will be asked from subjects of Mathematics, Physics, and Chemistry. The syllabus will be based on Madhyamik Examination conducted by West Bengal Board of Secondary Education (WBBSE).